There’s a popular myth that Alfred Nobel had wanted to create a prize for mathematics but didn’t want his love rival, the Swedish mathematician Gosta Mittag-Leffler, to win and so scrapped the idea. There’s no evidence for this persistent rumour so we have to assume the reason there’s no Nobel Prize for maths is because the subject wasn’t considered as important as physics, chemistry, medicine, peace or literature. Few would argue that learning to add up isn’t a vital skill. But there’s a further view that higher-level mathematics is unimportant for our society’s future and so doesn’t need to be taught to the masses. Guardian columnist Simon Jenkins makes this argument in a recent article ostensibly about the meaninglessness of international league tables in school maths. He argues that the political focus on improving maths teaching is pointless because so few people use what they learn at school later in life. He then takes a broad swipe: “Charge the maths lobby with the uselessness of its subject and the answer is a mix of chauvinism and vacuity.” By conjuring up this “maths lobby” bogeyman without making it clear who on earth he’s actually talking about, Jenkins is trying to make it seem as if maths teaching suits some shady vested interests and so we should disregard their arguments, whatever they might be. It might be better to look at the evidence. 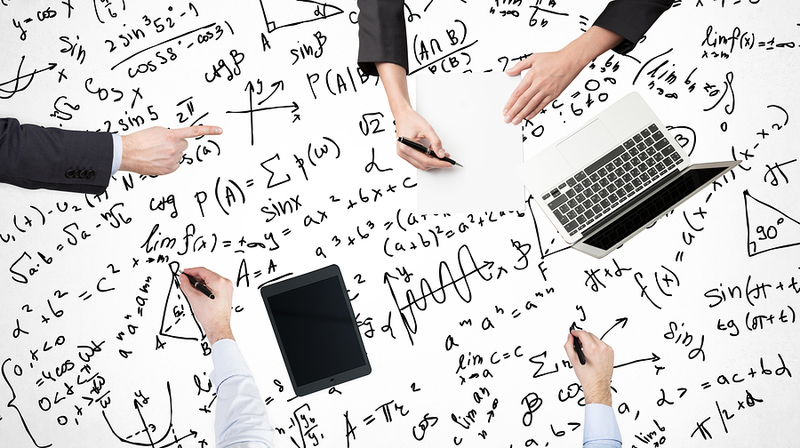 Mathematical sciences directly contribute about 10% of all jobs in the UK and 16% of gross value added to the economy, according to a 2013 report from Deloitte. Productivity – how much value each worker adds to the economy – is also more than double in maths-related occupations compared to the UK average. So at a time when productivity is poor and well-paying jobs are harder to come by, maths education presents a route to economic prosperity. It’s not hard to see why this is the case. Some of the most profitable, productive and important sectors of the UK economy such as IT, finance, aerospace, telecoms, pharmaceuticals and defence are dominated by mathematical thinking. It underpins just about the whole of modern science and engineering. Yet one of the key challenges for science and engineering employers is in recruiting and retaining staff with enough technical training. We need more people with an understanding of higher maths, not fewer. This is particularly true in engineering, where there is thought to be a shortfall of around 60,000 new engineering graduates a year in the UK. All engineering training at degree level requires quantitative understanding of risk, control, dynamics, stress distribution and optimisation. These topics in turn require the higher maths of algebra, calculus and probability. Even the geographical and life sciences would seem to be in some sort of maths crisis, because they increasingly involve drawing inference from large amounts of data. In bio-medicine for example, the sequencing of the genome and the latest imaging methods for live tissue mean that research and development is becoming dominated by so-called systems biology, which is built on mathematical and data modelling. Yet our teaching of biology in school remains largely focused on descriptive rather than quantitative approaches. And apart from some basic statistical training, medical students generally cease their mathematical education at age 16. Mathematical understanding is useful even in non-science careers. For example, if you’re buying ad space from Google it probably helps to understand how their system works. A large slice of Google’s present net worth is based on a clever piece of higher mathematics that drives its search function, namely the estimation of the leading eigenvalue of a huge matrix representation of all links in the world wide web. You may well not understand what this means but, far from being a specialist skill, appreciating this kind of mathematical terminology and reasoning is becoming vital for many current and future careers. Far from being a lone voice battling against the dominant “maths lobby”, Jenkins actually reflects the worrying value system in the UK that attaches little social importance to the ability to reason mathematically. How many times do we hear people claim, almost boastfully, that they are no good at maths (nearly always in the context of basic arithmetic, never mind higher maths)? Would they say the same about English? I’m not very good at spelling and never have been. But that doesn’t mean I don’t value the power and importance of the written word. A survey in 2012 found half of Conservative MPs and three-quarters of Labour MPs weren’t able to correctly answer the question of what is the chance of getting two heads in a coin toss (it’s 25%). Isn’t it alarming that the people whom society has charged with weighing up the risks between different policies, which can affect all our futures, don’t even have a basic grasp of probability? Perhaps there is some hope. The UK government announced in its recent budget that it would examine the feasibility of continuing compulsory maths education to 18. If this happened it may go some way to help the UK catch up from a position where it is investing half the G8 average in science, technology and mathematics as a percentage of GDP. For now, however, its stuck with ill-informed but highly regarded journalists making the problem worse. Maybe Simon Jenkins should follow the ethos of The Conversation and stick to writing on things he knows about.